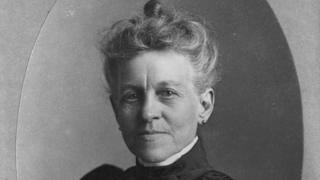 A 19th Century lighthouse keeper who became famous for her daring rescues at sea has been honoured by Arlington National Cemetery near Washington DC. Ida Lewis is the first woman to have a road named after her at the cemetery, which has more than 40 roads. Hers is one of two new drives as part of an $81.7m (£63.1m) expansion of the cemetery, the final resting place for presidents and many war veterans. Ida Lewis was keeper of the Lime Rock Lighthouse in Newport, Rhode Island. Her father became keeper of the lighthouse in 1854 and Ida Lewis took over the running of it - in 1879 - after her father, and later her mother, died. By the time she became keeper, she had gained a reputation for boldly rowing into stormy seas to rescue sailors in distress - saving more than a dozen people over the years, possibly as many as 25. She made her first rescue as a young teenager, and her heroism made national headlines in 1869 when she saved two soldiers from drowning. Accounts from the time say Ida was woken at dawn by her mother's concern for the two men. She jumped out of bed, and in only a light dress, launched her boat and rowed out to the two men who were shocked to find themselves being rescued by a girl. Her reputation as "the bravest woman in America" won her prestigious awards, She also met presidents and had musical works named after her. Hundreds of fans would travel out to Lime Rock to visit her. She died in 1911 of a stroke, and her heroics have since been largely forgotten. "It's a big deal," Karen Durham-Aguilera, executive director of Army National Military Cemeteries, was quoted by the Washington Post as saying. "It's a huge commemoration." The other drive in the new section of the cemetery is named after Marine Gunnery Sgt Jonathan W Gifford, who was posthumously awarded the Navy Cross for heroism after he died in Afghanistan in 2012. He is the first Marine to be honoured with a street name at the cemetery, reports the Washington Post.